It might sound like many business travellers’ nightmare, but Ibiza airport has opened what it claims is the first airside airport lounge club, complete with a dancefloor and electro-house DJ sessions. Provocatively named the F**k Me I’m Famous Lounge Club, the temporary facility is a joint venture between airport service provider Areas, and DJ and club promoting couple David and Cathy Guetta. The 24-hour lounge is located by gates 7 and 8 at Ibiza airport, and has been created as “the meeting point for personalities arriving to and leaving from Ibiza, offering DJ sessions, an original range of casual food and impressive views, around a dancefloor”. “A selection of the best DJs of the moment” will play at the club, which transforms through four ambiences during the day, from ambient chill-out music between 6am and 2pm, funk and Latin house until 7pm, house and deep house until midnight, and tech-house and electro-house until 6am. 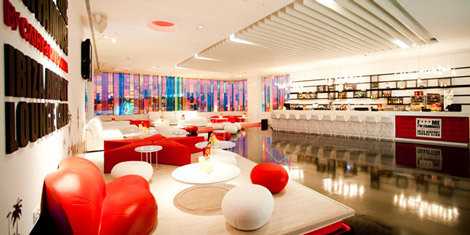 The lounge includes an LED entrance, red, black and white décor, a white bar and a “glittery floor”, while food and beverage options include roast chicken wraps and mini-burgers, as well as an extensive range of alcoholic and non-alcoholic drinks. For more information visit the F**k Me I’m Famous Facebook and Twitter pages.